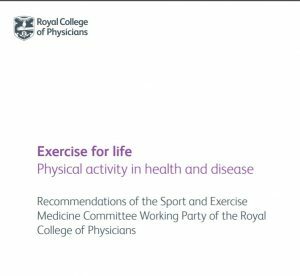 This report contains recommendations of the Sport and Exercise Medicine Committee Working Party of the Royal College of Physicians. Dr John Etherington OBE, FFSEM Director of Defence Rehabilitation and Dr Tim Swan FFSEM Sport and Exercise Medicine Consultant co-authored Exercise for Life. The document informs the Medical Royal Colleges, Faculties and connected organisations of the need to use exercise as a treatment and contains evidence for the benefit of exercise in many forms of disease – It is effective, inexpensive, with a low side-effect profile, and can have a positive environmental impact.